Singapore/Mumbai: A sharp drop in bullion prices prompted some buying interest on Asia’s physical market, but many remained reluctant to purchase large quantities as the year end approaches and the euro zone debt crisis threatens to further sink prices. Spot gold sank to $1,651.1 on Tuesday, its lowest in seven weeks, after posting its biggest one-day drop in nearly three months in the previous session, as the European Union summit disappointed investors. “Demand started to come in last night, but the amount has not been massive," said a Singapore-based dealer, adding that jewellers and bullion dealers from Indonesia and Thailand have been active buyers. In Hong Kong, dealers reported lukewarm reaction to the sharp price decline. Premiums were quoted in the range of 50 cents to $1.50, little changed from a week earlier. “People are still on the sidelines of the market," said a Hong Kong-based dealer. “They are worried about the euro zone debt situation and waiting for a clear direction." Investors were bracing for a possible mass downgrade of euro zone countries as soon as this week, which could further distress financial markets and drag bullion prices down with riskier assets. As the year end approaches, many traders have chosen to close their books and sit back to watch the euro zone crisis play out for the remaining few weeks of 2012. “Many clients, especially on the manufacturing side, don’t want to replenish their stocks right now," said a second Hong Kong-based dealer. “There’s little buying despite the price drop." He added that physical buying from China was lacklustre, partly as a result of tight liquidity at the year end. “The weakening price may in the short term even depress buying interest from retail investors, who now expect prices to fall further," said Hou Xinqiang, an analyst at Jinrui Futures in China. 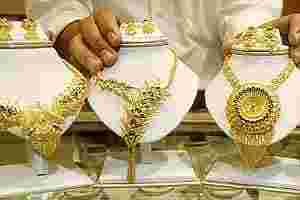 In India, the world’s biggest gold buyer, a record-low rupee has made gold expensive for Indian importers. Rupee-priced gold has gained 7% since November. “Rupee is spoiling the party," said Harshad Ajmera, proprietor of JJ Gold House, a Kolkata-based trader. The most-active gold contract for February delivery on the Multi Commodity Exchange (MCX) reversed its early losses to trade flat at ₹ 28,845 per 10 grams due to a weaker rupee. Investors will closely watch the bond sales from various euro zone nations, to gauge the sentiment around the debt crisis, before Christmas holidays start.